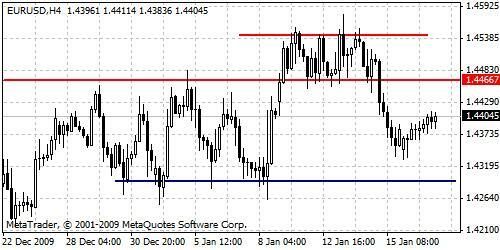 EURUSD, resistance level at 1.4466 holds bulls from further climbing towards next resistance barrier at 1.4540. Possible channel creation for now, it can be extended back to resistance barrier at 1.4466. At the moment waiting action remains and short term bouncing between current support and resistance levels is expected.